17 Mar Hey Siri! Let me introduce you to…..
A few years ago whilst working at Artificial Solutions my skunkworks team put together a prototype dev portal that would allow any developer to create Natural Language features for their own apps or be plugged into what was to become our virtual assistant, subsequently named Indigo. The marketing team launched this at Mobile World Congress in 2012, but for numerous reasons this was never thrown over the wall for a production release. The Teneo Platform is a great NLP platform nonetheless, with a full suite of engineering tools. Since then a number of similar platforms have attempted the same by exposing SDKs and Platform APIs providing other engineers with some creative freedom. Perhaps the most notable one that I’ve had the opportunity to play with is Alexa, Amazon Echo’s NLP & ASR platform. It’s pretty darn good, and I’m using it for another project. The hardware strategy for this of making conversational UIs so readily available for users is a key driver for it’s success. I believe Alexa will be as successful for Amazon as it’s AWS service is. The Apple development community though is still waiting for access to Siri’s core technology platform, so “Hey, Siri! Let’s introduce you to the possibilities. Mobile is now the primary computing platform, but screens are cluttered with apps users rarely used, and the app marketplaces are now a quagmire of applications that drain hours of your life as you attempt to find solutions to your particular problem. Siri’s prominence on the home button of every iPhone, iPad, Apple TV, and soon enough your Mac, provides the perfect gateway solution to decluttering your life from a myriad of unnecessary apps. Like any good ‘real-life’ personal assistant Siri doesn’t know everything herself, but does know who to ask or where to find an answer (eg. Siri goes to Wolfram Alpha to find weight and measures or Wikipedia to find out how big the Eiffel Tower is). I decide I would like to upgrade so go ahead and tap ‘Yes Please’, and then confirm payment using Touch ID. 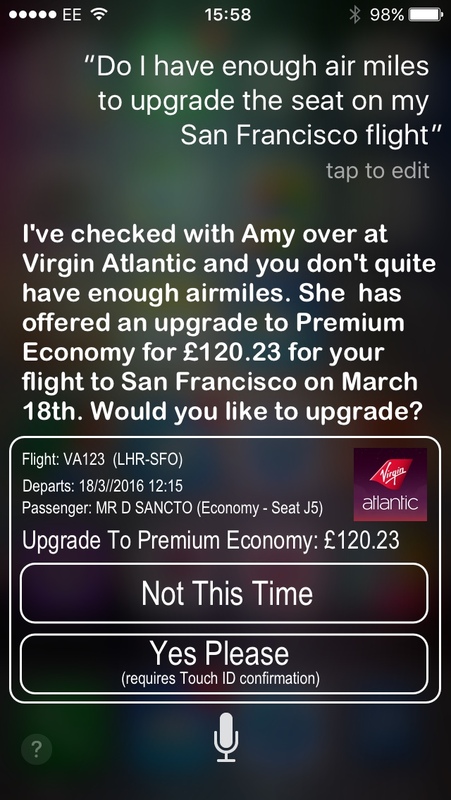 This little transaction could have happened either with Siri as an intermediary (as pictured) or as a hand-off to Amy. It’s a Win-Win-Win situation for all. 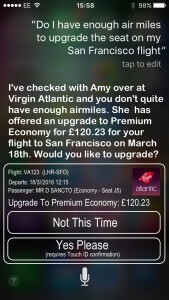 I don’t have another app cluttering up my phone and get a hassle free experience, Virgin doesn’t need to maintain a client app, instead they have a far more efficient server side app to maintain, plus Apple & Virgin get more data to analyse and use for a host of improvements, including a more proactive Siri. 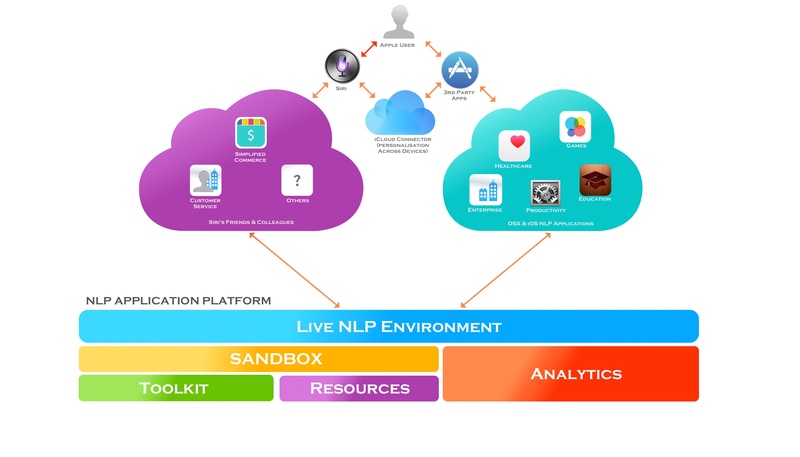 These NLP systems have so many uses beyond this type of productivity and commerce scenario. Language is the most basic form of communication that every human knows, whatever their understanding of technology or access to education. It’s the very foundation of human communication and that makes these NLP systems incredibly powerful for every enterprise and consumer. Whether it’s health care, education, even entertainment, and everything in between. Apple announced last year that Siri was processing 1Billion requests a week. If that rose by just a fraction, the commercial proposition for Apple could easily generate a revenue stream in the hundreds of millions, even billions, given Siri’s scale, based on what competitors like IBM are charging for Watson, plus the knock on effects to the app markets and Apple Pay market. It’s the potential of these ‘platform plays’ that make Apple more valuable than just a hardware company. Aside from Siri based applications, there are a wealth of viable opportunities in the Apple ecosystem that could make good use of Siri’s technology stack. 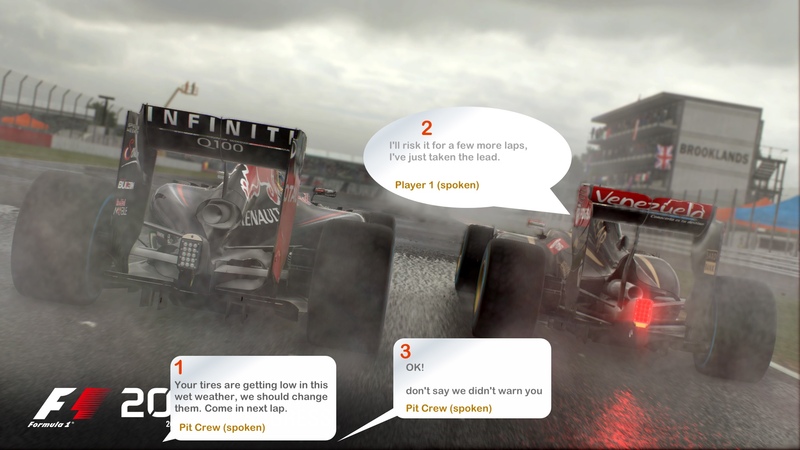 The game just became more immersive as the experience becomes more realistic. I’ve only illustrated two use cases for the technology, but the possibilities are endless. If like me you’d like to see Apple open up the Siri technology stack, then do like this post or comment below. Perhaps public opinion will grab their attention. If you’re looking at this type of tech for a project and would like some help please get in touch, I’m always happy to help if I can, or point you in the right direction. In the meantime, “Dear Apple, please let us introduce Siri to some friends and colleagues”. Release the Siri Development Kit, and let the creativity begin!